In Prenatal Yoga, we take time out to connect to our bodies and our growing baby by using our breath and our attention, so that we can have moments of realizing the hugeness of what is happening our lives. Yoga helps us make the most of our 9 months, so that we are fully prepared to be the mother we want to be. So often, in our busy lives, we can even forget we’re pregnant. Having a consistent practice helps us experience and enjoy our changing bodies. In Mom + Baby, we heal together, slowly re-connecting to our strong core and finding ways to nurture ourselves while nurturing baby. We learn specific practices – not just on the mat, but off as well – to revitalize and energize throughout our busy day. And we get to feel connected to other MAmas while being with baby, practicing finding our authenticity within our new, intense and sometimes overwhelming job. Moving through the journey consciously in this way also helps us handle the transformation of our lives, our relationships, our work; even our sense of our selves, what is important to us, and our values. All of it changes, and if you have been constantly adjusting for baby throughout your pregnancy, the big change of bringing baby home might feel less intense. And since we incorporate time for connecting and checking in with each other, we don’t have to feel isolated when we’re at home with baby. We can always come back and do some yoga, or meet some mom friends in the park to get some grown-up conversation. Even when we are alone, we have the tools to connect to that part of us that is supported by the bigger energy that we all hold in our hearts for each other. 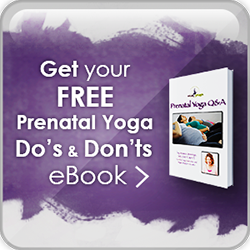 What is prenatal yoga good for? What is Mom Yoga + Baby Good For? 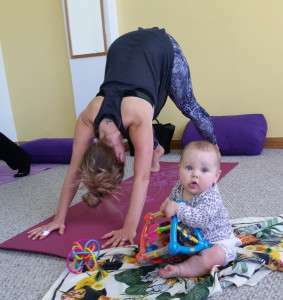 In Mom Yoga + Baby, we focus on regaining a connection to our strong core, getting prana (the energy that nourishes the physical body) flowing again, and enjoying our body and our baby. It takes about 9 months for your body to change completely, and yet we often rush to get back to “normal.” If we take the time to slow down, heal, and enjoy this time, we can have a body that’s better than ever. In Mom Yoga + Baby, we will focus on regaining a connection to our strong core, getting prana (the energy that nourishes the physical body) flowing again and re-connecting to each other. Come enjoy some down dogs between feeding and changing your baby… and some grown up conversation too! 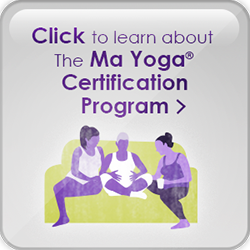 Experience a powerful connection to your breath, your body, and your baby – and become the Ma you want to be! Try a free class.